Darwin made a discovery new to science when he observed cilia moving the microscopic larvae of a species of the bryzoan Flustra. He rushed to tell Grant, confirming Grant's belief that the larvae of these marine animals were free swimming, but was upset when Grant claimed rights to the work. Darwin also made the discovery that black spores often found in oyster shells were the eggs of a skate leech, and was disappointed when Grant announced both finds to the Wernerian on 24 March 1827 without giving Darwin credit, though Grant in his publication about the leech eggs in the Edinburgh Journal of Science later that year acknowledged "The merit of having first ascertained them to belong to that animal is due to my zealous young friend Mr Charles Darwin of Shrewsbury", the first time Darwin's name appeared in print. 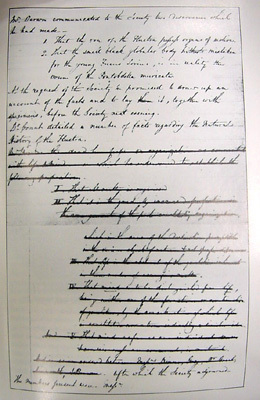 Darwin made a presentation of both discoveries to the Plinian Society on 27 March, his first public presentation. Later in the meeting Browne argued that mind and consciousness were simply aspects of brain activity, not "souls" or spiritual entities separate from the body. A furious debate ensued, and later someone deleted all mention of this materialist heresy from the minutes. This was Darwin's first exposure to militant freethought and the storm it stirred up. Darwin gave his first scientific speech at a meeting of the Plinian Society. The subject was his discovery that the larva of sea-mats can swim, and that the tiny black specks inside old oyster shells were skate leech eggs. Not the most earth shattering discovery, but it was a start for Darwin. Darwin started the next period in his life which started by him giving his first scientific speech in March (at a meeting of the Plinian Society) and during the summer of 1827 he took great interest in one of his sisters best friends Fanny Owen. The Plinian Society was a club for students at the University of Edinburgh who were interested in natural history, founded in 1823 by a group of undergraduate students. Several of its members went on to have prominent careers, most notably Charles Darwin who announced his first scientific discoveries at the society.